Many men think it’s not macho to worry about their skin. But it’s not only women who get skin outbreaks as a result of cancer drugs. Skin is our largest organ, so it is inevitable that cancer treatment can compromise it, but how many men would think of complaining about this? Asking for ‘Skin advice’ is somethinng left to women; men usually suffer in silence! But now the charity Look Good, Feel Better (LGFB) has decided to do something about this silence. They organise men-only sessions, where they can get together, find out about looking after their skin, and discover ways of relieving itching and scaly scabs., etc that come with many cancer treatments. Itchy skin can drive you mad, but now men don’t have to suffer in silence. The Charity started with a series of ‘pilot’ sessionsfor men in 2017 which led to the launch in a small number of venues at the beginning of this this year. 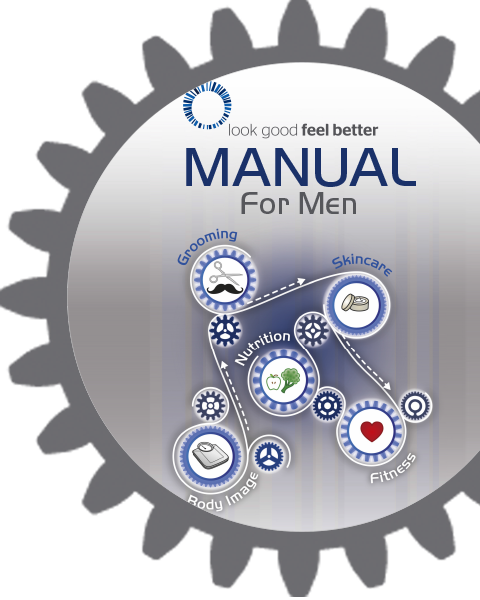 LGFB has also launched The Manual for Men; working with a number of leading experts, this detailed 34 page booklet includes information on skincare, shaving and grooming, oral health, how to dress/what to wear as well as advice on nutrition and fitness. It is available for free via email or post. this series of tutorials covers information on how to manage dry skin, shaving advice, how to disguise redness and dark shadows and dressing for your shape.